I remember hearing once that if someone doesn’t like green vegetables it could be because they really do taste bad to them. There apparently are some people who taste things differently. In this case for some reason green vegetables taste soapy to them. I’m not sure of the specifics, but how horrible would that be? 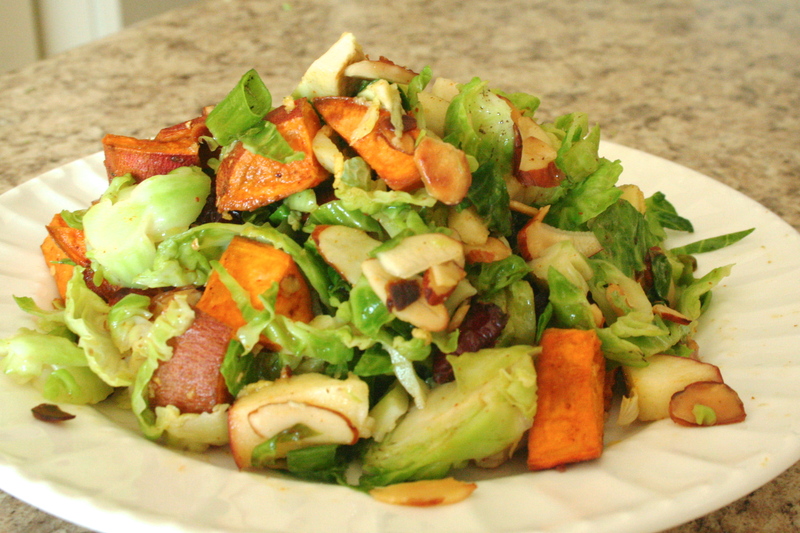 You would be missing out of so many delicious vegetables and so many nutrients that go along with green veggies. For example, brussels sprouts! Brussels sprouts get a bad rep and if, like many, when you think of brussels sprouts you think of stinky, mini, boiled cabbages…. you are totally missing out on how delicious these little bit size greens can be. Brussels sprouts are not only delicious (when cooked correctly) but also packed with fiber, vitamin c, potassium and are naturally low in calories. Well, today was one of those days that I didn’t feel like just having roasted brussels sprouts (my usual favorite way to cook them, a little olive oil salt, pepper and lemon…oven 400 deg F. till crispy ) I decided to get a little crazy and make a brussels sprout salad (much better than boiled…eww) So, with the exception of those with taste buds that make green veggies taste like soap, if you have the above opinion of brussels sprouts, hopefully this recipes will help to change that view! Preheat oven to 400 deg F. coat diced sweet potatoes in about 1 tsp olive oil and season to taste with salt, pepper and chili powder. Bake in oven till fork tender, remove and allow to cool. 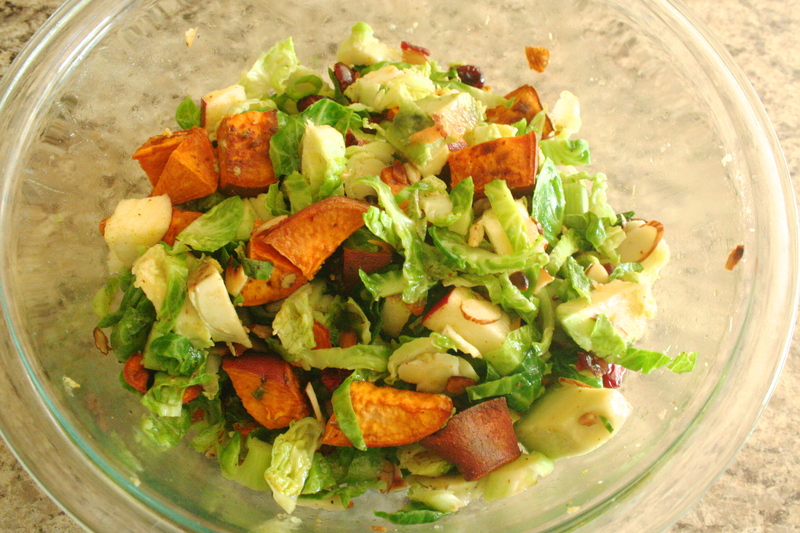 While sweet potatoes are baking make the dressing. Combine ginger, honey, vinegar, and siracha to taste. Once the sweet potatoes are done or close to done saute brussels sprouts in 1 tsp of olive oil till tender and starting to crisp. 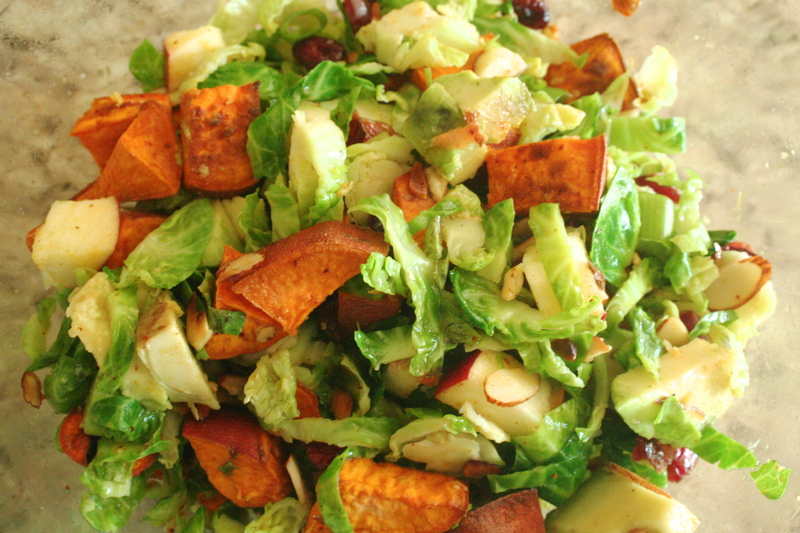 In a bowl combine sauteed brussels sprouts, roasted sweet potatoes, toasted-sliced almonds, diced apple, green onions, avocado, and dressing. Mix to combine and enjoy!